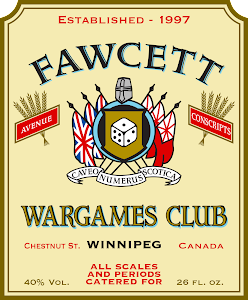 The Fawcett Avenue Conscripts are a group of table-top wargamers who get together every Thursday night to enjoy some gaming, some beer and a few chuckles courtesy of our hobby. "The Alpha Legion wants you to MOVE YOUR CAR..."
I'm on vacation this week, but still managed submission number 12 for Curt's Analogue Hobbies Painting Challenge before I left. This is a Deredeo Pattern dreadnought battle armour, painted in the colours of the Alpha Legion from GW's Horus Heresy setting. I can't top the quick explanation of dreadnoughts that JamieM already offered in his submission featuring Thousand Sons Space Marines. The dreadnought is a power armour unit driven by the ruined remains of a fallen Space Marine. As Jamie said, if you are going to exist solely in a coffin covered in guns, you might as well do it in a fully pimped out ride. The Deredeo Pattern suit delivers...it will provide serious firepower to support the requirements of Alpharius' lads. I love the look of this sculpt - it fits with the other 30k dreanought suits, but evokes things like the crazy Macross destroids or the "ED 209" from Robocop, among other things. The guns, the armour, it's all over the top - and that makes it ideal for 30k in my books! This thing is armed to the teeth - and the teeth probably explode or something too. Features such as the Anvillus autocannon battery, Ailos missile launcher and body mounted heavy bolters all ensure enough firepower to wipe out any inconvenient loyalists or witnesses the Alpha Legion would care to obliterate. There is an option to equip this model with flame throwers in place of the heavy bolt guns on the hull, and I'm able to do it in this case because of: MAGIC. The model is a big sucker, bigger than the other dreadnought models. Seems fitting to me, as it is carrying enough weapons to fight its own war. So a huge, huge, "thank you" to Steve B for his help and skills, and I hope my painting does his efforts justice. I am super psyched to have this model finished, and can't wait to take it for a stroll on the gaming table. As a newly painted model, I'm sure it will dominate the table, right? See you all next week for more Painting Challenge mayhem! Follow us by Email - we promise it's better than spam! Painting Challenge Theme Entry - "West"
(c) 2008-2012 by the Fawcett Avenue Conscripts. All rights reserved. Watermark theme. Powered by Blogger.